Tunisia has been in the news recently for all the wrong reasons, including a horrific terrorist attack on the beach, in which many British citizens were killed. However the Arab Spring of 2011 sparked a change of government and the story of Tunisian democracy is not all bad. In a detailed blog and interview there is a hopeful description of how community participants in 4 districts tackled a basic issue affecting many… the adequate provision of street lighting. From such simple services government is built. Below is an extract from the blog by Daniel Schugurensky, professor in the School of Public Affairs at Arizona State University. "Since the Jasmine revolution of January 14, 2011 that sparked the Arab Spring, Tunisian social and political life has changed considerably. After 23 years of the brutal and corrupt regime of General Ben Ali, the people of Tunisia started to experience the basic preconditions of a democratic state for the first time. Among them are freedom of expression, freedom of the press, and political pluralism, including competitive elections. The intense fear that characterized the 1987-2011 period was suddenly replaced by a general enthusiasm to rebuild government at the state and local level and to promote democratic institutions and practices. Some of this enthusiasm was translated into action with the election of parliament and a head of state, the peaceful transition of power and the promulgation of a new constitution that devotes several articles to decentralization and participatory democracy. 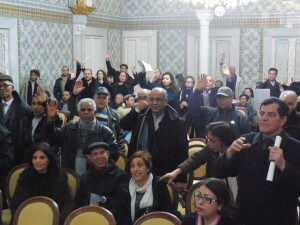 Decentralization is an important issue in Tunisia. As Bedis Bouziri points out in our conversation, municipalities have so little autonomy that they cannot even make decisions about sewage or speed bumps. Things are slowly starting to change, one step at a time. In 2014, Tunisia implemented participatory budgeting projects in four municipalities: La Marsa, Menzel Bourguiba, Tozeur and Gabès. The residents of these four municipalities proposed 63 projects, and after a process of deliberation 29 of them were voted for implementation. To the best of our knowledge, with these four projects Tunisia has become the first North African country to undertake participatory budgeting. On the evening of Sunday, May 17, after the Global Forum on Modern Direct Democracy, Decentralization and Participation celebrated at Carthage University, I had the opportunity to talk with Bedis Bouziri, who volunteered as facilitators of the participatory budgeting of La Marsa in its first cycle in 2014 and again in the second cycle that is taking place in 2015. "